I paint original abstracts whenever I have a moment. 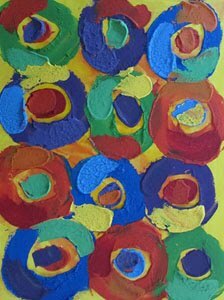 First I mix many bold acrylic colors in my painting studio and place them next to my waiting canvases. Then I drop tarps down to protect the floor and I select the brushes and painting tools I want to use, or experiment with. 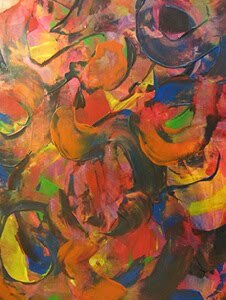 I don’t worry if I don’t feel inspired to paint, The act of painting abstract art is inspiring to me, my arms and body know what to do even if my mind is slow to start and once a bold color goes down on the canvas I just want to add more colors. Distractions can be going on all around me and I don’t even notice. My abstract painting time is sacred to me. I sometimes look at my finished abstract paintings when I want to continue with a style or technique I’ve been developing, or I may put the final touches on a previous abstract canvas before starting a new modern painting. 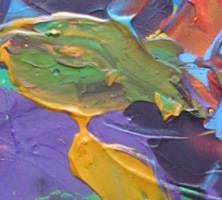 Otherwise I just start painting colorful abstracts using bold thick colors and trust the process, because new painting techniques and textures are created that way. 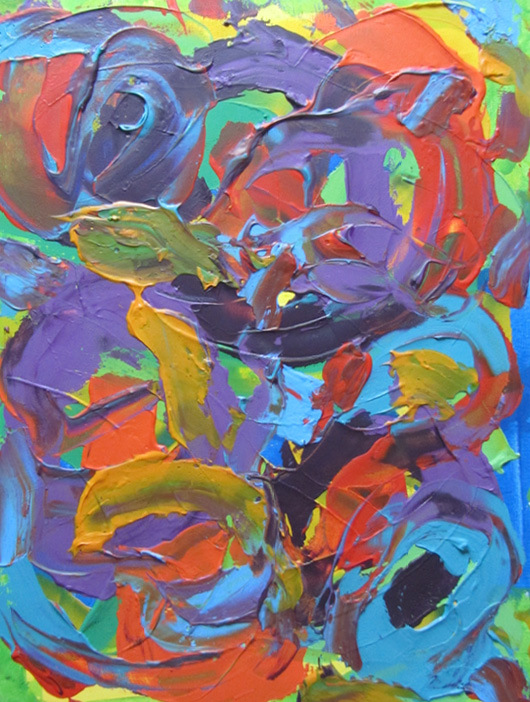 The abstract painting Young Girl Feeding Birds shown above is a textured acrylic in purple, teal, red, orange and yellow. Paint was applied thickly in this modern abstract where a young girl spreads seeds on the ground, but the birds are impatient and know her well, so they land on her shoulder and on the plate she holds. This original wall hanging measures 18" x 24". 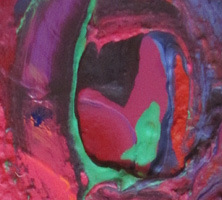 Original abstract art reveals a side of you people don’t normally see. Abstracts are anything but dull. Whimsical unexpected abstracts keep people interested and guessing. 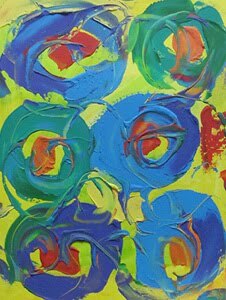 So display colorful abstract paintings in your home to show your bold, inspired, or playful spirit. The bold modern abstract canvases you choose to hang in your home represent who you are and how you feel. 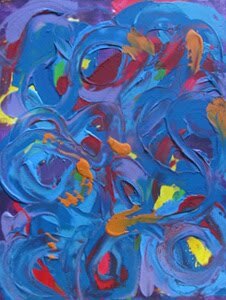 Abstract is pure emotion through color. 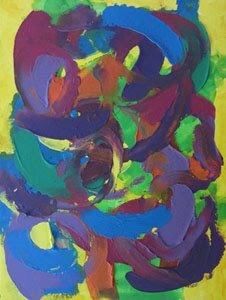 The best abstracts provide a heightened experience for the senses with masterful bold strokes and unique textures that accentuate your home’s decor style. 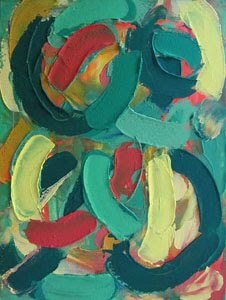 Buy abstract wall hangings from an abstract artist who is fearless with color, who uses paint layering and texture on canvas to depicted their subject matter in an engaging way, which in turn will enrich your home’s decor and more importantly your life. 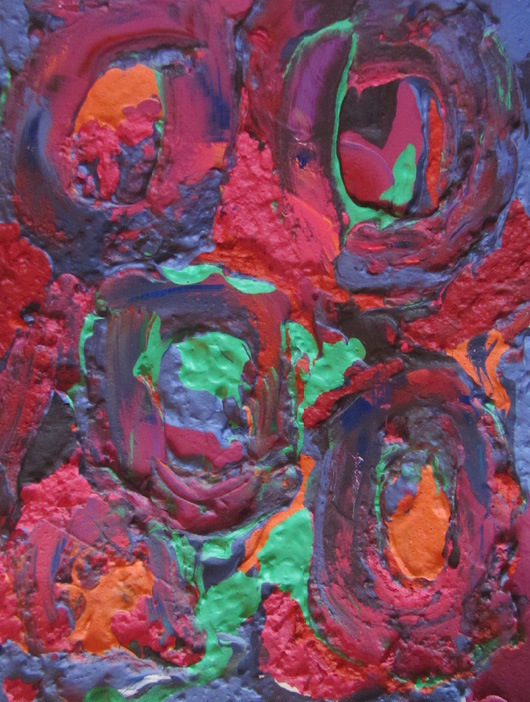 The abstract painting Puppy Dog Eyes shown above is a textured acrylic in pink, rose, red, deep blue, purple, green and orange. 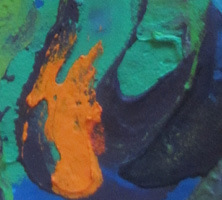 Paint was applied thickly to this modern abstract canvas. Kids receive soulful stares from the family dog who is waiting to be taken outside. This original wall hanging measures 18" x 24". Painting a colorful abstract on a free afternoon is bliss. All colors are my favorite, but I particularly like bold colors and the unexpected that can happen when color and texture is combined. 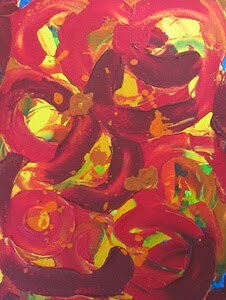 An abstract painting can make you feel like you're falling in love, or make you feel serene yet full of energy and inspired. I enjoy the complexity of emotions a single modern abstract painting can evoke. As an abstract artist those positive feelings are what I want to capture again and again. 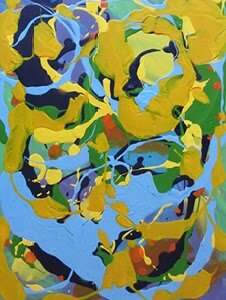 My favorite inspirations for my bold abstracts come from nature; blue sky, mountain ranges, big flower gardens and forested areas where birds are singing. Festivals are inspiring too, the bold colored costumes and body movement of the dancers comes through in my modern contemporary painting style. I also love to express internal struggles and that moment when clarity arrives. At other times the path my paintbrush takes comes from an inner restful place. 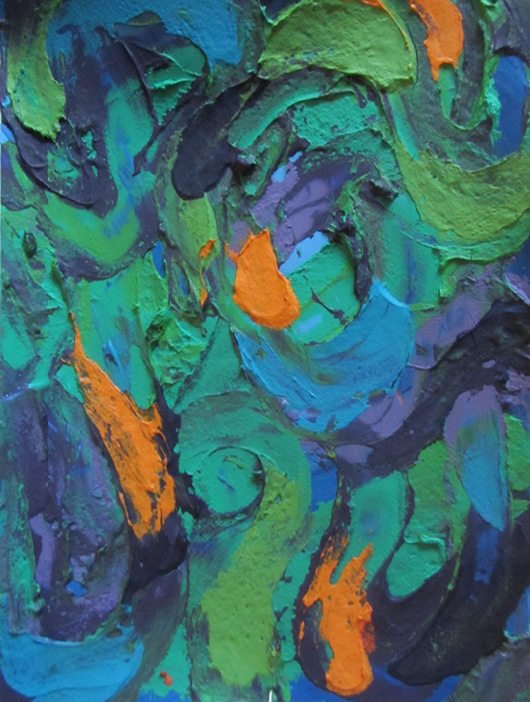 The abstract painting Evening Walk shown above is a textured acrylic in green, deep blue, purple and orange. 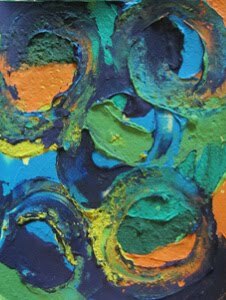 For this modern abstract art the paint was applied thickly to canvas. Walking on a lamp lit path, the candles burn bright to hold back the night, but the shadows still grow and later blend into a peaceful sleepy dream. This original wall hanging measures 18" x 24".